and ask Jesus to speak His word to us. Held in Atlanta, GA, last January 1-3, at the Georgia Dome, and attended by over 42,000 college age youth, one can observe Lecrae (a converted rap and Hip Hop artist), Francis Chan, Louie Giglio and John Piper, along with thousands of youth, participating in the mystical practice of contemplative or “listening” prayer at Moore’s behest, and this despite the fact that Scripture provides no instruction or any illustration for engaging in such a “spiritual” activity. Those promoting contemplative or “listening” prayer refer to this Scripture as a biblical endorsement for pursuing this spiritual discipline. As a precondition for experiencing Soul-to-soul communication from God, contemplative Christians advocate cultivating quietude for the purpose of creating a spiritual tabula rasa (i.e., Latin for blank slate) in which personal communication from God can be received. Influential Christian leaders and spiritual directors encourage listening prayer (praying without words) as a means to experience ”God’s guidance in everyday life.” At face value, Psalm 46 verse 10 appears to endorse this increasingly popular but ancient and mystical way to pray. BE STILL... demonstrates how contemplative, or ‘listening,’ prayer can be be a vital way to find peace in the midst of a frenzied, fast-paced, modern world. BE STILL examines the importance of silence and reflective prayer as a way to receive God’s guidance in everyday life. BE STILL... features a useful ‘how to’ section that shows how contemplative prayer can be used to return to a more simple life and reaffirm that which is truly important. As advocated by some of today’s most notable Christian communicators, what should Bible believers think about this DVD advocating contemplative prayer? Bible Interpretation 101 teaches that every text without a context is pretext. Extracting Psalm 46:10 to be an endorsement of meditative-listening prayer is just such a pretext. Here’s why. Third, verse 10 contains two co-ordinate imperatives, with the emphasis being on the second command, to “know that I am God,” not the first, to “Be still.” With the first imperative functioning as an adverb, the verse might read, “Calmly (or quietly) know that I am God....” Thus by their focusing upon the initial command, to Be still, comtemplative spiritualists ignore the greater command, and that is, to know that I am God. The command “know” primarily means, “to know by observing and reflecting (thinking)....” As such, believers are encouraged to find comfort of soul by reflecting upon the saving works that God has both performed and promised. The meditation the psalm envisions is therefore objective, not subjective. “Be still” does not call persons to induce within their consciousness a wordless void or incubator in which state a mystical experience or word can be hatched. The cognitive command to “know” cancels that notion. In the light of God’s mighty works and providence, the psalm exhorts believers to reverence Him. As the prophet Habakkuk wrote, “...the Lord is in His holy temple. Let all the earth be silent before Him” (Habakkuk 2:20). And finally, in the third section the Psalmist looks forward to a new order when God will impose his peace plan upon the world (See Isaiah 2:4.). As He will have ended conflicts and destroyed the weapons of war (vv. 8-9), the Lord affirms that in the coming kingdom age he “will be exalted among the nations” (v. 10). In view of this prospect, the sovereign Lord encourages his covenant people to, “Be still, and know that I am God....” In the end, the sovereign God will defeat war and end terrorism. There resides a potential danger in mystical practices. It is this: In their attempt to journey into an altered state of consciousness, contemplative meditators may forget that God is the object and they are the subjects. As the theologian Warfield noted almost a century ago, “The history of mysticism only too clearly shows that he who begins by seeking God within himself may end by confusing himself with God.” Thus by fixating upon the secondary imperative “Be still,” contemplators may, like eastern mystics and New Age devotees, forget they are not God! A friend of mine, devoted to the pursuit and practice of alternative spirituality for some of his adult life, related how one New Age class adapted this verse for use. At each session’s beginning, participants were told to relax and say to themselves, “Be still and know (pause)... I am God.” Thus by using the psalmist’s words to affirm their own divinity, New Age practitioners turned God’s Word outside in and upside down! The Passion Movement, which held its first conference in 1997, continues to grow by leaps and bounds. Passion 2012 – a three-day event – concluded yesterday and attracted around 45,000 enthusiastic attendees to the Georgia Dome. For those like me who were not familiar with this huge event, here is a brief overview as well as a recap. The exact opposite of mind-numbing meditating is the rehearsing of God’s Word on one’s mind for edification, encouragement and strength. Scriptural meditation involves going over and over Scripture in one’s consciousness. In this activity, in one's “right mind,” the Holy Spirit seals the eternal truths of God in the soil of the regenerate human soul thereby bringing the life of the Word of God to the inner man (2 Corinthians 2:16). “Beth Moore Leading Lectio Divina lite With John Piper At Passion 2012,” YouTube, January 5, 2012 (http://www.youtube.com/watch?v=ArNVa27hBCs&feature=player_detailpage). Readers might note that Beth Moore, in addition to Dr. Henry Cloud, Richard Foster, Max Lucado and others, is one of the featured speakers on the Be Still DVD documented in footnote number 3 below. On the video recording, one can observe her in addition to Lecrae (a converted rap and Hip Hop artist), Francis Chan, Louie Giglio and John Piper and thousands of college-aged youth participating in contemplative or listening prayer. Advertisement, Christianity Today, April 2006, p.5. Be Still (DVD © 2006 Twentieth Fox Home Entertainment LLC). Op. cit. Of this type of construction (imperative waw imperative, “Be still and know”) one grammar remarks that, “the second verb usually expresses the principal idea, while the first indicates the manner, and may conveniently be rendered in the translation by the use of an adverb.” See Ronald J. Williams, Hebrew Syntax: An Outline (Toronto, Canada: University of Toronto Press, 1969): 43. Merrill F. Unger and William White, Jr., eds., Nelson’s Expository Dictionary of the Old Testament (Nashville, TN: Thomas Nelson Publishers, 1980) 212. Craig C. Broyles, Psalms (Peabody, MA: Hendrickson Publishers, Inc., 1999): 210. Benjamin B. Warfield, “Mysticism and Christianity,” The Works of Benjamin B. Warfield, Vol. 9 (Grand Rapids, MI: Baker Book House Company, 2003): 661. New Spirit Filled Life Bible, Jack Hayford, Executive Editor (Nashville, TN: Thomas Nelson, Inc., 2002): 724. The original article by Pastor Larry DeBruyn is posted at http://guardinghisflock.com/2010/04/09/be-still/#more-936 and this version is reproduced with his suggested significant additions. 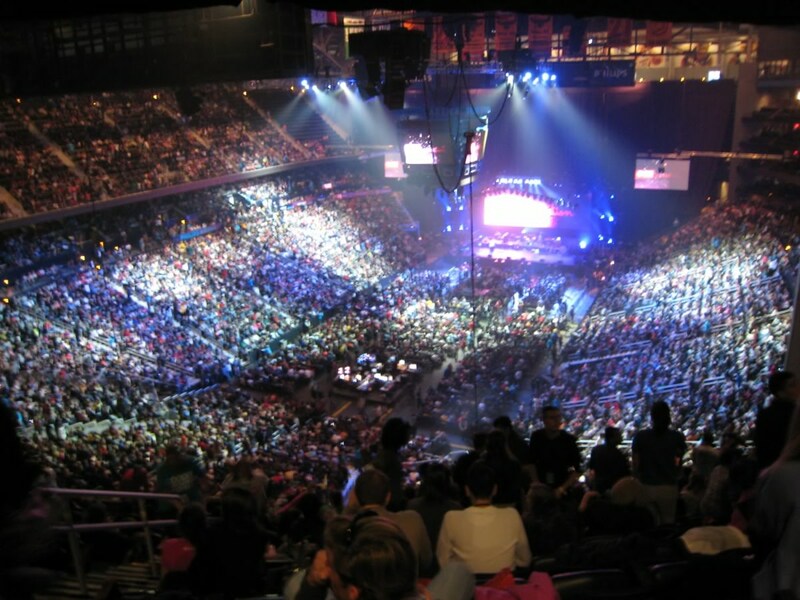 The Wartburg Watch 2012: Dissecting Christian Trends: Passion 2012 – A Recap," The Wartburg Watch, January 6, 2012 (http://thewartburgwatch.com/2012/01/06/passion-2012-a-recap/). Bold added. 13. Apprising.org, "BETH MOORE AND JOHN PIPER SET FOR PASSION 2013 WITH LOUIS GIGLIO," Ibid. See the film footage posted at this site for illustrations of the concerns expressed in this article. "Altered States: A Different Gate," http://herescope.blogspot.com/2011/04/altered-states-different-gate.html. Related reading: See Herescope posts by Pastor Larry DeBruyn "Getting 'High' on God" and "Getting 'Higher' on God" and Hush! Whispers at Willow Creek."